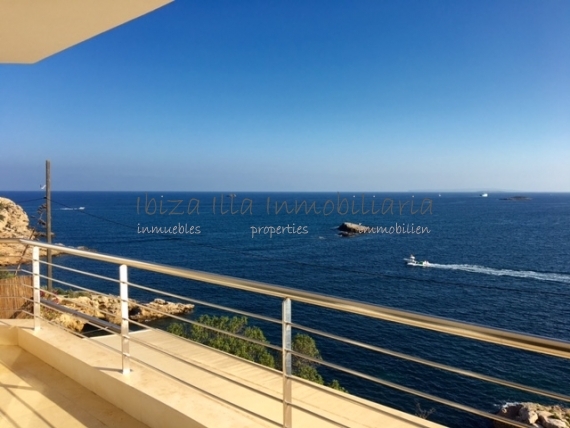 Spacious apartment with spectacular views situated on the seafront of Ibiza town. At the top of a hill neatly tucked just a few minutes walk from the center of Ibiza town we discovered this fabulous property in a well kept residential built 10 years ago in front of the sea. South facing has sun all day. His views are a dream and changing according to the season; small islands in the sea, the coast and the neighboring island of Formentera forehead. The flat has very little hall being perfectly distributed in 3 double bedrooms, 2 full bathrooms, one en suite, a living room with open fully equipped kitchen and a terrace with shower and enough space for garden furniture and enjoy the sun and relax.